My art practise involves the construction of sculpture, drawing and collaborative performance/dance work. The research is concerned with the relationships between three-dimensions and two-dimensions, the physical and metaphor,movement and stillness,light and shadow. Work is made for gallery exhibitions,interior/exterior sites and architectural spaces.My work explores shape, line, form, perimeter, position,location, in response to spaces within, around and in-between. My concerns are to construct work in harmony with the space in which it is to be located, whether it is a domestic, architectural, landscape or urban environment. To create spaces that can celebrate the location, and the constant changes of the surroundings, people moving, light and weather. 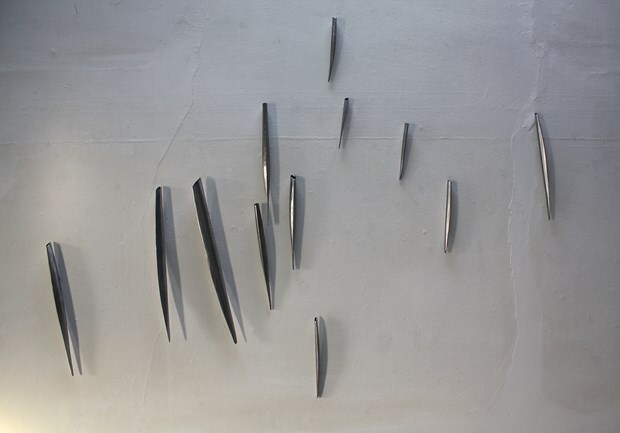 Essentially for me, the sculpture is about creating forms that encourage contemplation,a sence of time and place, an awareness of changing natural light throughout the day, in and around the material form. The sculpture articulates light, shadow, darkness,internal and external spaces. These elements become intrinsically and metaphorically expressive. The intention through making art, is to create a spiritual presence that has a timeless quality. To discover and create experiences of stillness and quiet. Initially I develop ideas in note books, drawing shapes and forms, often in response to a line, contour curve of the body or a natural form, in contrast to straight, more measured lines. The shapes are used both for large scale drawings and also to make patterns for the development and construction of sculpture. Rythm and repetion are also important construction and expressive elements, which relate to my interest in sound and music. In early 2011 my work was installed in the ICC Building,Hong Kong for the Ritz Carlton Hotel on the 118th floor. I was commissioned by CE Sun Hung Kai Properties for the installation of wall based work, for three sites. These works were develpoed in response to the location and interior architecture, using forms that hang from fine stainless steel cables, which were repeated across a given space, changing the size of the form,to imply a sense of depth and movement. Within the collaborative multi-disciplinary work, I am interested in exploring the relationship between form,body,movement and sound. In 2001,I became the founding artistic director of Sculpture, Dance, Performance Collaboration Ltd. and director of the performance work 'so far, so near' which we performed in Rehovot Municipal Gallery,nr.Tel Aviv, Israel and in the Square Chapel, Halifax, West Yorkshire.The Artists that collaborated for this project were Irit Bluzer-performance artist, dancer- Andrea Buckley, video artist-George Saxson,composer-Jim Beirne, and phonic artist- Helmut Lemke. In November 2012 I began to work again with Irit Bluzer, we developed a new performance work titled 'StorRa'.This collaboration continued through 2013 to 2014. The first performance of 'StorRa' was performed in the event '25 Performance Art Platform' in Tel Aviv, Dec.2013. Influences : Landscape,Nature, Japanese art & culture, Minimilism, Sexuality/Gender, Contemporary classical music, Contemporary dance, English and North American art, own gender (Female) Career path 1985/86 Sculpture Fellowship, Yorkshire Sculpture Park 1985 Research Fellow, Humberside College of Higher Education 1983 Artist in Industry Fellowship 1978/79 Fellowship in Sculpture, Cheltenham Art College 1976/78 MA, Fine Art 1973/76 BA Hons Degree in Fine Art Received numerous awards,including a Henry Moore Bursary in connection with Yorkshire Sculpture Park,1991-92. Yorkshire Arts Awards - 1980, 1993, 1997, 2000, 2001. Combined Arts Award, 1999, for research and development of sculpture,dance,performance collaboration with video,music and phonic art. Awards for All, 2002, for S D P C Ltd. Sculpture and drawing included in private and public collections in Britain and Europe. Most prestigious commissions - a permanently sited, outdoor, stainless steel sculpture for the Halifax Building Society, 1989-'Side by Side': a permanently sited,public sculpture 'Far and Beyond' 2006, for Ashwood Business Park, Ashington,Northumberland, commissioned by One NorthEast,a regional development government agency. A private large-scale sculpture commission for the grounds of a house, was installed on site in 2008. 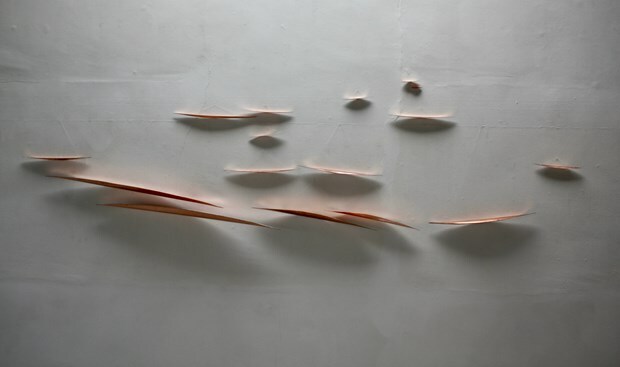 In 2010 CE Sun Hung Kai Properties Group (via Walsh Greene, art consultants) commissioned wall based sculpture, for 3 sites in the Ritz Carlton Hotel in Hong Kong, China.These works were installed in 2011. 'So far,so near' Sculpture, dance, performance with music/sound, video, collaboration with performance artist-Irit Bluzer,choreographer/dancer-Andrea Buckley,composer-James Beirne,video artist-George Saxon,phonic art-Helmut Lemke. Performances and residencies at Rehovot Municipal Art Gallery, nr.Tel Aviv 2000 and Square Chapel Arts Centre, Halifax 2002. 'Surface Tension'(version 1) Performance and residence at Leeds City Art Gallery- Sculpture, Dance, Music, Collaboration with choreographer/dancer, Gregory Nash and composer/musician, James Beirne - commissioned by the Henry Moore Centre for the Study of Sculpture, 1990. 'Surface Tension'(version 2) Performance and residence with Gregory Nash and James Beirne - commissioned by the Contact Theatre, Manchester, and the Yorkshire Sculpture Park 1992. '5 x 2 Collaborations' - Choreographer/dancer,Gregory Nash and sculptor, Joanna Mowbray-Purcell Room, South Bank Centre, London, 1990. Work exhibited in galleries and sculpture parks both nationally and internationally. One person outdoor exhibitions at the Yorkshire Sculpture Park, 1985-86 and 1995-96. Exhibited in London,Scotland, Northern Ireland, Belgium, France, Northern Ireland, Palestine, Israel, Tokyo, Australia, Luxembourg, New York, Hong Kong. Currently sculpture is on show in Belgium, near Antwerp, at Tweede Natuur, Lia Schelkens Gallery: The University of York, Heslington Hall: Ashwood Business Park, Northumberland: ICC Building, Ritz Carlton Hotel, Hong Kong. Since 1978, employed as a Lecturer/Senior Lecturer, in Fine Art, at BA Hons Degree and p/t MA level,within Art Schools and Fine Art Departments in Universities,nationally. Appointed as Reader/Professor in Sculpture, Fine Art, at Hull School of Art & Design, University of Lincoln in 1998. External Examiner for undergraduate courses at University of Wolverhampton 1997-01 and Liverpool John Moores University 2002-07. 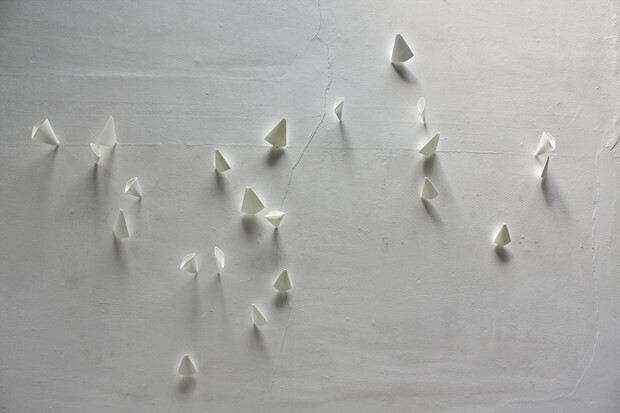 2015 - Joanna Mowbray, New small sculpture and wall based constructions,Lia Schelkens Gallery. Tweede Natuur, nr. Antwerp. Belgium. 2018 - ING Discerning Eye Exhibition. The Mall Galleries, The Mall, London. 2018 - 'From the Kitchen Table' / Drew Gallery Projects. Herbert Read Gallery,UCA Canterbury. 2008 - Drawn to sculpture, Fermynwoods Contemporary Art, Brigstock, Kettering.UK. 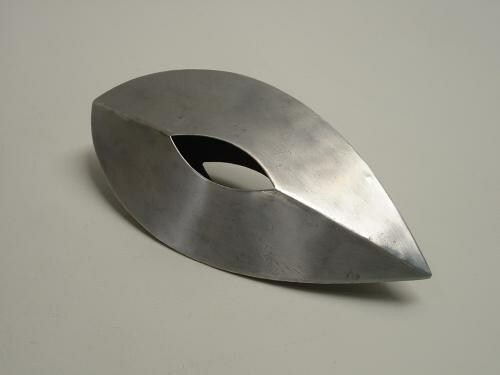 1996 - Collection (sculpture on exhibition 96-02), New Art Centre, Roche Court, Salisbury, Wiltshire. 1992 - 'On The Brink?' An exhibition of Four Contemporary Women Sculptors. In conjuction with the International Art Historians Conference,titled-Subversions/Objects , The University Gallery, Leeds., Leeds,West Yorkshire. 1987 - 'New Art in Yorkshire', Leeds Metropolitan University Gallery, Leeds. 1986 - 'Open Air Sculpture Exhibition' Lincoln, Hull, Scunthorpe., Lincoln - Castle grounds, Hull - Queens Gardens, Scunthorpe -Town centre. 1983 - Artists in Industry Exhibition,Yorkshire Arts Association, Touring Exhibition: The Mappin Art Gallery-Sheffield,Rotherham Arts Centre,Piece Hall-Halifax,Bolton Art Gallery,Huddersfield Art Gallery,City Centre Arts Centre-Edinburgh, , Ferens Art Gallery-Hull,Cooper Art Gallery-Barnsley,Royal Festival Hall-London. 1983 - Yorkshire Arts Touring Exhibition, St.Paul's Gallery-Leeds,Mapin Art Gallery-Sheffield,The Cooper Gallery-Barnsley,The Washington Arts Centre-Tyne and Wear,, The Elizabethan Gallery-Wakefield. 1992 - Surface Tension (version 2) working with choreographer/dancer Gregory Nash and composer James Beirne,contemporary dancers and musicians. , The Contact Theatre, Manchester., Yorkshire Sculpture Park,Bretton Hall,West Yorkshire. 1990 - Surface Tension (version 1) Dance,sculpture,music,collaboration with choreographer/dancer Gregory Nash and composer/musician James Beirne, Leeds City Art Gallery, The Headrow.Leeds. 2016 - 2 'open hearts' , Private collections, Belgium. 1996 - The Exterior Gardens -Shortlisted for Design proposals & maquettes , Public Arts, The Orangery, Wakefield, West Yorkshire. 1994 - Roadworks - Shortlisted for Design proposals & maquette for sculpture commission. , Hare Street Roundabout , Bilston, Wolverhampton. 2005 - University of York, Hesligton,York. 1996-2004 - 'Beyond and Within' sculpture on loan at the Yorkshire Sculpture Park,YSP collection. 1989 - Halifax Building Society. 2001 - Yorkshire Arts Award, Yorkshire Arts- Funding for new sculpture'Drawing in space 2' exhibition in Belgium., Schildehof,Nr.Antwerp,Belgium.